When you want an edge against your opponent, you look for any statistics or measurable value that could help you win your league. While you get points from an individual players’ performance, how important is it for your player to have a strong supporting cast around him? Josh Gordon was a stud for a team that finished with a 4-win season, so does it matter how good a players’ team is? It makes the most sense that a quarterback’s success would be connected to playing for a winning team. As the field general, quarterbacks are one of the biggest pieces for a teams’ success or failure. If you are a quarterback and play for a winning team, you obviously have a major role in the success of your team. 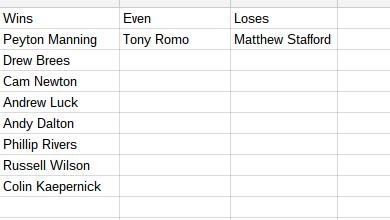 Findings: 90% of the top-10 quarterbacks played for teams that finished the year with winning or even records. For the top-10 running backs, seven out 10 finished the 2013 season with winning or even records. Adrian Peterson, Chris Johnson and Fred Jackson finished the year ranking seventh, eighth and tenth respectively. The results were a bit mixed for wide receivers. When you break down the data, only 50% of the top-10 wide receivers had winning seasons, 30% were even and two had losing seasons. It is also interesting to note that Josh Gordon finished as the highest-scoring receiver but played for a team with a losing record, and Calvin Johnson finished third with a losing team as well. Findings: 80% of the top-10 wide receivers played for teams that finished the year with winning or even records. The amount of tight ends in each category was identical to wide receivers. Five tight ends played for teams with winning records, three played for teams that finished even and two played for teams with losing records. Findings: 80% of tight ends played for teams that finished the year with winning or even records. Quarterbacks skewed the data, but there was never an instance where there were more top-10 players with even or losing records than players with winning records. 23 out of the top 40 players at their positions in fantasy football were on winning teams, nine played for teams that had even records and eight played for teams with losing records. 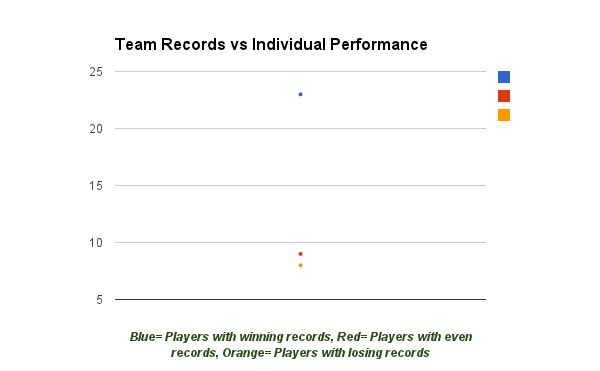 Interpret this data as you may, but you have a better shot of your player finishing in the top 10 at his position with a winning team than a team that will break even or lose.